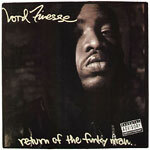 Return Of The Funky Man is the second album by New York legend Lord Finesse. Released in 1992, this album was very anticipated after his debut on the scene just a few years prior. Having already established himself as a punch-line king capable of humorous storytelling, Return of the Funky Man cemented Finesse as a top notch producer. Tracks such as ''Fat for the 90s'' and ''I Like My Girls With A Boom'' showed the Funky Man truly living up to his name, both on the mic and behind the boards. After the gruff voiced ''Lord Finesse Intro'', the album goes on for 15 tracks on a nonstop journey of witty word play over top notch production. Along for this ride Finesse brings D.I.T.C brethren Showbiz and Diamond D on the production side while A.G and (at the time) newcomer Percee P share mic duties. Topically, Finesse doesn't stray too far from reminding us why he's earned the title ''The Funky Man''. Whether it's bragging and boasting, or breaking down females, he has a way of doing it with a tongue in cheek type way that is sure to have you letting out a laugh or two each couple of lines. He possesses that rare quality of being a solo MC that is capable of entertaining throughout the entire hour plus listening experience. Stand out tracks such as ''Yes You May'', ''Stop Sweating the Next Man'', and ''Party Over Here'' all show why this album was instantly praised by fans and critics alike.